Building an atmosphere at your event is all about the lighting. If you’re getting married at venues in and around London and the South East; Surrey, Kent, Berkshire, Hampshire and more, DJ2K can provide not just the music and the magic, but the lighting as well. If you want to light up your special day, use specialists to illuminate your event room. We’re familiar with most of the top, prestigious wedding and event venues in London and the Home Counties, so we know what works. We know how to create atmosphere through lighting. We’re experts in setting off dance floors and different reception areas through uplighting. And we can offer a full range of the most innovative, exciting and wow-factor new lighting solutions on the market today. The magical finishing touches that we can provide will create a jaw dropping, wow factor impact on you and your guests. Using the very latest on trend, high quality and innovative products we can completely transform rooms and dance floors. 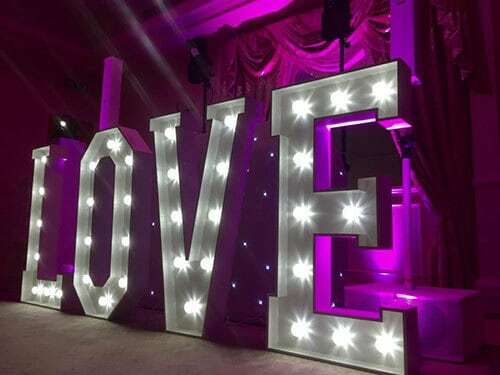 Framing your dance floor with eye-catching illuminated letters will set off your first dance and your disco perfectly. With a range of combinations from Mr and Mrs, to initials and fun words like ‘dance’ or ‘party’ – this is the ideal enhancement to your venue. What makes our giant illuminated letters such a brilliant concept? You may be wondering what this is but it’s a funky and highly effective way of sweeping a light projection around the room on a glass disc. 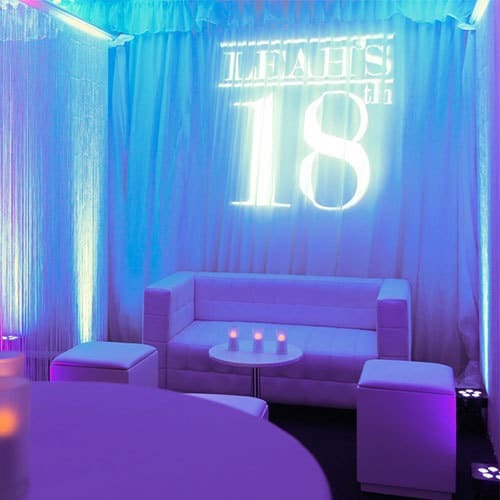 The design illumination could be anything – your initials, a heart, a 21 for a 21st birthday – but either way it will get your guests’ attention. We can help with ideas, designs and ordering of your Gobo and project it around your function room for an added touch of wow factor. You want to build atmosphere, you want to look your best and you want your guests to feel comfortable. And using uplights is the way to do it. During the speeches and meal, you’ll want the room to look bright and clear. Your first dance needs to be magical, intimate and romantic. When your guests are hitting the dance floor, they’ll feel more comfortable in low lighting. We’re experts at designing the lighting theme for your room, using the very latest uplighting products. From the number of uplights, to the colour of the uplights, to altering the lighting throughout the day and evening to suit what’s happening, we’ll ensure the illumination is perfect, and exactly what you want. 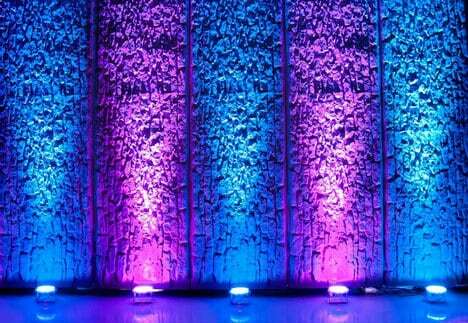 What makes our mood lighting and uplighting so sensational? 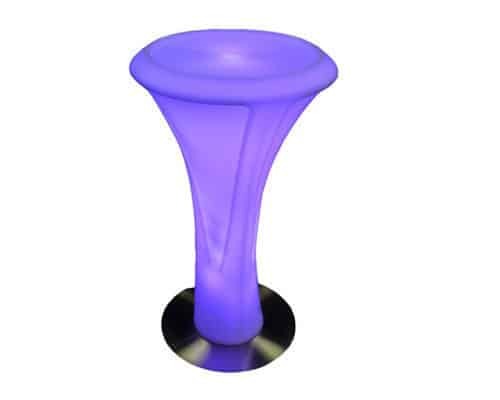 What better way to add impact and excitement to your reception room than to offer funky illuminated tables for guests to use for their drinks. These innovative lighting options will turn a reception into a true party and create a magical and awesome enhancement to your evening. No more hunting round for drinks on darkened dining tables! Your guests will love the upmarket and stylish experience of using LED/illuminated furniture at your wedding or event. For something truly unique and seriously special, opt for LED trees for weddings. These breath-taking decorative LED trees can bring class, creativity, jaw-dropping impact and a talking point to your event. An LED tree can provide an uplifting enhancement when placed around a room; at the entrance to a room; to frame the stage, and can be used inside or outside on a patio or terrace. 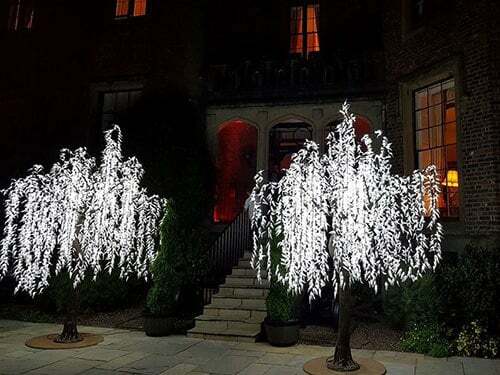 We can source a range of stunning LED trees for weddings for hire in Surrey. 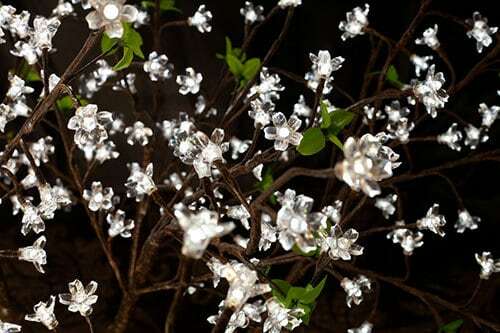 For fairy light trees, wedding trees, LED trees, Blossom Tree hire in Surrey, London or the Home Counties contact us now. To book or find out more about our innovative and stunning lighting enhancements, please don’t hesitate to call DJ2K on 0800 783 2928, or alternatively fill out the form below.